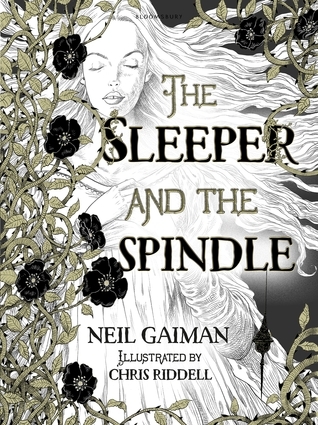 The Sleeper and the Spindle by Neil Gaiman, illustrated by Chris Riddell is fantastic! It was part of my Christmas gift prom my husband and I absolutely love it. It is gorgeous and just flicking through it makes me happy. I love Neil Gaiman’s writing and Chris Riddell is my favourite illustrator. They have perfect collaboration on creating something amazing. I already have their editions of The Graveyard Book and Coraline, but this book is a masterpiece of aesthetic pleasure. The cover has no writing on it, just a picture of the Sleeping Beauty, but the semi-transparent dust cover has the thorns and the credits on it. Unfortunately, I discovered that my pet ferret Loki poured a full glass of water on my dust cover and it got ruined. I tried to save it, but it will never be the same again. Nonetheless, the illustrations are made in just three colours – black, white and gold. Every detail, every wrinkle, every facial expression looks great. Pictures complement the writing in the best possible way. I am a fan of Neil Gaiman and love the way he can tell a story. This book is his version of Snow White and Sleeping Beauty coming together in one story. It is not exactly like the we heard before. The story has a twist and a girl-kissing-girl moment (not conventional, but also not as naughty as you might think). Neil Gaiman is a great story teller and even though this book is only 68 pages short, he manages to put a lot of events, character and emotions in it. I find it a true quality mark of an excellent writer, as some can’t achieve this much even in 500 pages. Fairy tale is a hard genre for writers but Gaiman masters it gracefully. I would recommend this book to anyone who likes beautiful art and fairy tales. It is a great gift and could be given to people who don’t have the patience to read long books. I rate it by 10 out of 10 as it made me very happy and I will definitely flick through it every time I move the books on my bookshelf. This entry was posted in Home, Reviews, World of Books and tagged amazing illustrations, book review, Chris Riddell, gift, Neil Gaiman, The Sleeper and the Spindle. Bookmark the permalink.